At the core of the Panther 4.0, users can choose between multiple graphics cards: the NVIDIA GeForce 580M with 384 CUDA cores and 2 GB of GDDR5 RAM for high-performance gaming, NVIDIA Quadro 5010M with 4GB of RAM or the AMD Radeon HD 6990M with 2 GB RAM for those looking for a high-performance workstation class performance. Users can additionally select a choice of a single graphics card or two in NVIDIA SLI or AMD CrossFireX mode for the ultimate in gaming performance and image quality. With the fastest NVIDIA GeForce notebook GPUs in NVIDIA SLI mode, NVIDIA Quadro GPU or AMD Radeon GPU this new graphics powerhouse is the ultimate mobile gaming and workstation machine. Driving the system is Intel Core i7 3960X Processor Extreme Edition running at up to 3.9 GHz with 15MB of L3 cache, which delivers exceptional high-def multimedia, multi-tasking and multi-threaded performance. 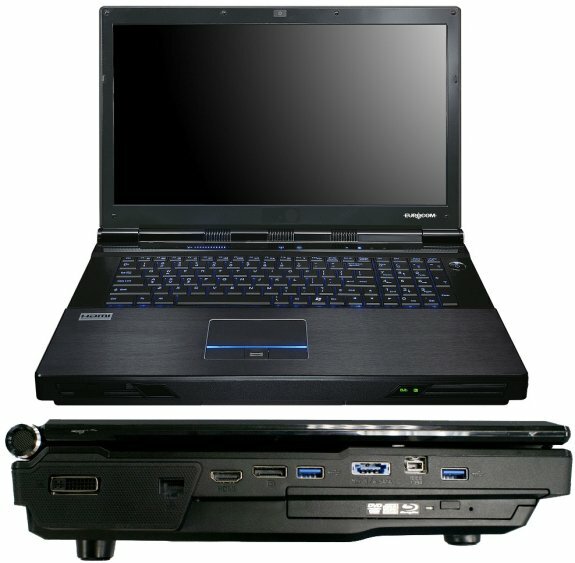 It also supports the newest line of Intel Core i7 processors and next generation Intel Xeon Processors. These high-performance CPUs allow users to simultaneously run multiple applications at the same time -- all with increased performance. The Panther 4.0, which measures 16.76" x 11.44" x 2.31"/ 419(W)x286(D)x57.9-62.1(H)mm and weights 12.1lbs/5.5kg, also supplies tremendous SATA-600 storage (up to 4TB using four storage drives), allowing users to save more of their favourite photos, music, games, and more, as well as headroom to install additional office and entertainment applications. Customers may also choose between RAID 0, RAID 1, RAID 5 or RAID 10 for the ultimate transfer rates and application load times or redundancy.